In the previous post we discussed some of the things you should do to keep your dirt bike in good conditions. Today, we want to focus a little more on the importance of providing quality lubrication for your dirt bike and how to select the proper motor oil for the task. In order to provide the best lubricant for your dirt bike you first need to be aware of the needs and differences of your dirt bike. Each model and brand of dirt bike have its differences. Yet, in general, there are two main types of dirt bikes: two-stroke and four-stroke. The difference lays in the engine and the way it completes its functions. Two-stroke engines are more simple and carry out only two main processes. Four-stroke engines are a little more complex and carry out two additional processes to those of two-stroke engines. Regardless of the engine that your dirt bike has, all dirt bikes must be equipped for the harsh conditions of off-roading. The trail conditions, environmental contaminants, and rough roads all take a toll on the engine. That is why it is absolutely crucial that you keep your engine protected with a durable and highly efficient lubricant. Synthetic motor oil is ideal for protecting dirt bike engines because it can withstand any extreme temperatures and all strenuous demands placed on dirt bike engines. AMSOIL provides the best dirt bike motor oils to ensure the safety and performance of your engine. Contact Green Spring Tractor now to obtain the best lubricants for all your engine needs. Two-stroke engines have two main actions: compression and combustion. Every revolution of the crankshaft the engine ignites the spark plug making it quick to fire and giving it continuous power. Two-stroke dirt bikes require a mix of lubricant and fuel in order to power and lubricate the engine. Their simpler process requires that these two solutions be blended together. The way it works is that when the pistons rise in the combustion chamber the ideal combination of fuel, oil and air rush in. Next, this is compressed and fired up by the spark plug. It then detonates, and causes the pistons to be lower back down. As this repeats, it creates a continuous process that creates two strokes of the piston for each ignition. Which is why it is called a two-stroke engine. The first stroke is the compression stroke and the second is the combustion. The entire process of a two-stroke engine relies on the mixture of air, fuel, and oil. Due to this fact, two-stroke dirt bikes have different lubrication needs and require a special blend of motor oil and fuel. The most common type of lubricant for two-stroke dirt bikes is a premix. Premix oils are a mix of oil and gasoline but it is vital that the right oil to fuel ratio is used. 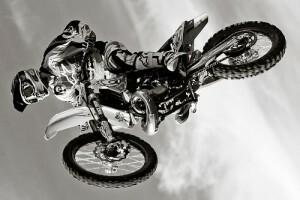 This ratio is not the same for every two-stroke dirt bike and you must consult the proper ratio with your manufacturer. It is usually stated in your owner´s manual, along with any other important recommendations for choosing the proper lubricant. Four stroke engines have different lubrication needs because their four-part process distinguishes them and separates their fuel needs from their lubrication requirements. The four-strokes carried out inside this type of engine are intake, compression, combustion, and exhaustion. For more information on four-stroke dirt bike engine, read the following article, on the Dirt Bike Tips and Pics website. Four-stroke engines have lubrication needs that are very similar to your car´s. That is why four-stroke dirt bike oil comes in different oil grades similarly to those of car oil. Based on your brand and model the manufacturer will provide you with the right type of oil grade for your specific model. In the owner´s manual, you will find this and other information regarding the lubrication needs of your dirt bike. In some cases, you may also be provided with of oil grade ranges that you can use depending on the road and seasonal conditions. Don´t forget that along with your oil change you should also change your dirt bike´s oil filter. At Green Spring Tractor you will find all the best products for the maintenance and care for all your engine needs. AMSOIL Dealer - James Martin is always more than happy to assist you in selecting the ideal motor oil for your dirt bike. Contact him now at (717) 776-4040 and ask about AMSOIL's specials.